DIS/rupt is now in its final few weeks at Gallery Oldham – it closes on 24th February – and you will have to travel to the Minerva Art Centre, Llanidloes in lovely mid Wales to see the work. More information about that in a future post. However before it leaves Gallery Oldham I thought it would be interesting to hear what it has been like to have the TSG exhibition in the gallery from the people in whose care it has been since before it opened at the beginning of December and I have received this from the Gallery’s point of view. There are nearly 2 weeks left to see the DIS/rupt exhibition at Gallery Oldham. It’s been on display for nearly 3 months and will be touring the UK, its next stop will be Minerva Arts Centre, Wales. Here Visitor Experience Assistant Rachel Ford gives us an insight in to what’s been involved from Gallery Oldham’s side of the project. After months of planning, the gallery team had 1 week to prepare the gallery for the DIS/rupt exhibition. This included moving walls and painting them. Rebecca the Exhibitions and Collections Coordinator (Art) worked with Sarah Burgess from the Textile Study Group on the challenging tasks of laying out all 23 artists’ artwork, giving thought to the design layout and allowing each piece of artwork to have its own identity. The collection of artworks although fragile were quite easy to hang and the natural light from Gallery 2 complemented the artists chosen colours. Just before the grand opening on 2nd December 2017 the artist Sarah Burgess gave the front of house team a prep talk on each piece of artwork. This talk with Sarah gave us the opportunity ask questions and explore the exhibition. I was very interested in the research involved to obtain statistics relating to rising sea levels across the world for Sarah Burgess Artwork Drowning By Numbers: 2 Degrees and 4 Degrees. Sarah explained that various studies had taken place by university groups and the studies showed that if the temperatures rise globally by 2 or 4 degrees it is likely to have a devastating impact on at least ten cities worldwide, this would then have a knock-on effect destroying crops, homes and industry. 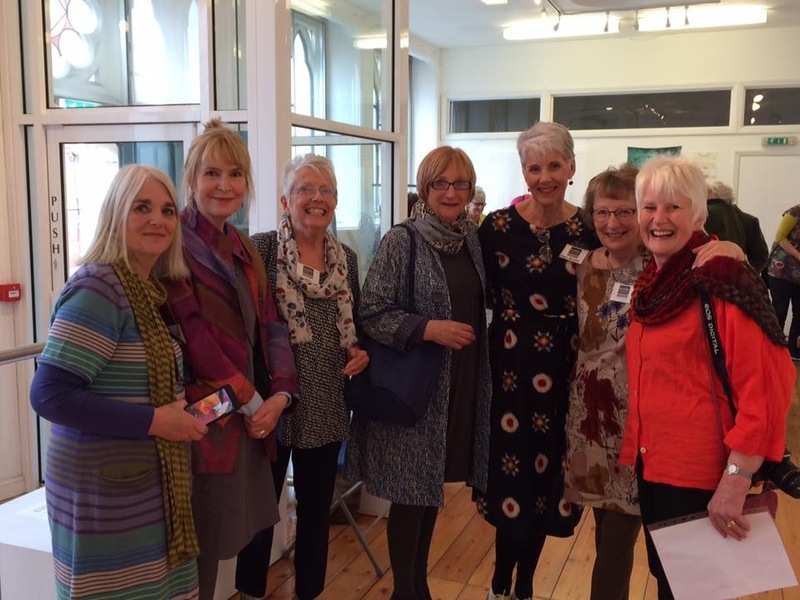 The Textile Study Group are a group of nationally and internationally recognised textile artists and tutors based throughout the UK. The group are well known for innovative and challenging approaches to art practice and contemporary teaching. The exhibition explores the concept of disruption in its widest sense. Through extensive research the group decided to explore several themes, including global conflict, concomitant problems of migration and the refugee crisis; climate change and ecological disruption; conflict within domestic relationships; and disruption within traditional fabric making processes. My favourite piece in the exhibition has been Sian Martin’s, Dispatched With A Kiss. I found the story and the beautiful array of colours very moving. Inspired by a true story, the piece of artwork represents a timeline about a boy named Ahmed. Ahmed lived in Afghanistan when aged 15, ISIS came to his village and stole his two sisters and killed his father. His mother told him to run away and gave him a kiss on his cheek. The piece itself is about 4 meters long. It begins with bright colours that represents Ahmed peaceful life. The colours then fade and bright orange fabric is threaded onto the steel, this represents Ahmed’s journey as he travels to France and Britain. Towards the end the fabric becomes much less. A pair of lost shoes represent the journey that many other refugees will continue to take. 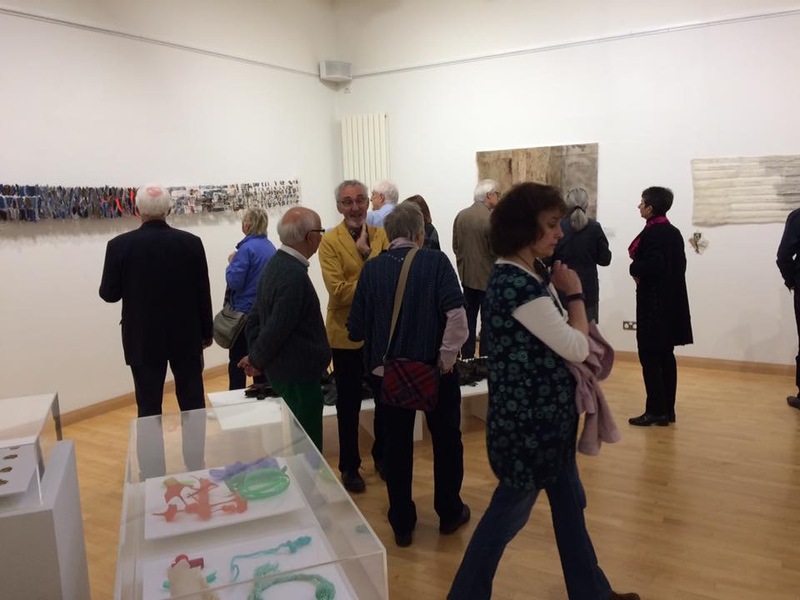 The exhibition has been very popular, with visitors travelling from all over. 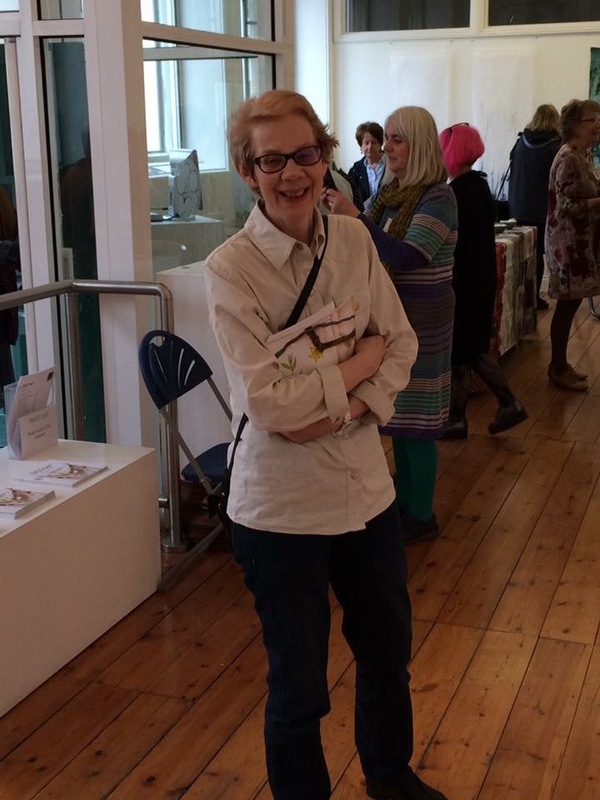 The workshop with Artist Sarah Burgess sold out within the first few weeks upon opening and The Textile Study Group catalogue has been selling like hot cakes. But before it leaves Gallery Oldham on Saturday 24th February, come and take a look at this amazing talent. Thank you Rachel. 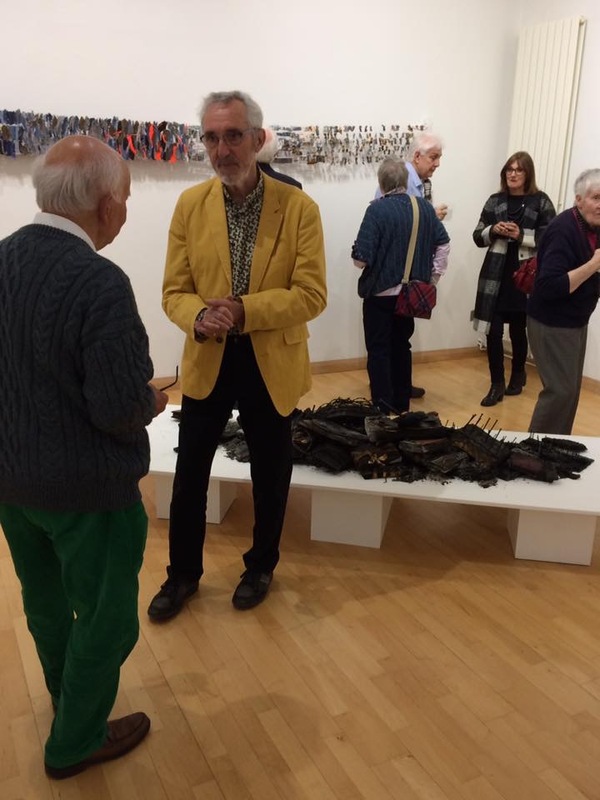 It is always good to hear other view points of artists’ work and having your account from the perspective of the Gallery will be of enormous interest to readers. 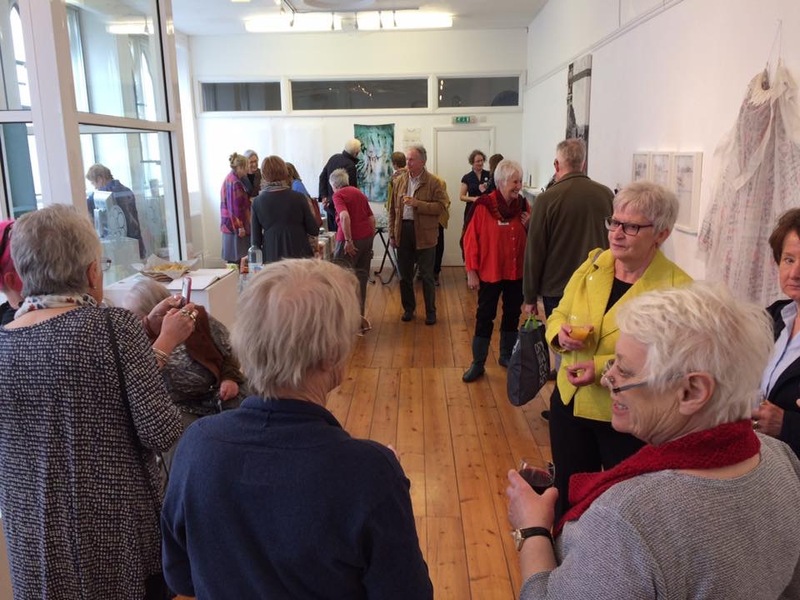 Remember, the exhibition ends 24th February and our next post will give more information about its move to the Minerva Arts Centre. Catalogues can also be purchased through a link on the group’s website. My work explores climate change specifically in relation to warming sea temperatures which are affecting the world’s coral reefs. I am a great beachcomber and on some of my travels I had collected a few tiny coral fragments from the beach. They were beautiful, mainly bleached white with interesting marks, pattern and detail. I had already begun to draw and use these as a source of mark making. So it was a natural progression for me to develop this interest. I focused my research on coral bleaching, which is thought to occur when water temperatures rise for a sustained period of time. Coral is a living creature and the most obvious sign that coral is sick is coral bleaching. This happens when the algae on the coral surface dies or leaves the coral. The algae give coral its colour, so without it the coral has no colour and the white of the limestone shell shines through the transparent coral bodies. Whilst researching the project I came across a lot of statistics, mostly relating to percentages linked to the amount of bleaching on reefs around the world. One shocking statistics that I came across was ‘only five percent of the worlds coral reefs are in pristine condition’. Another stated that ‘fifty percent of the world’s reefs are damaged through bleaching’. I wanted to portray these statistics, so I decided to create one hundred small components with each representing one percent of the world’s coral. Half of the units are shades of white which represent the bleached coral. Five of the units are very brightly coloured, with the rest somewhere in between. I made marks made by printing, scorching and stitching. The marks were inspired by marks and patterns found on coral. I used a variety of lightweight and transparent fabrics which I fragmented, manipulated, shredded and layered. Some of the pieces are very distressed as I tried to portray the skeletal qualities and fragility of the damaged coral. I also discharged colour to emulate the bleaching. I wanted to refer to the many written statistics that I discovered during my investigations. So I included text relating to my research. I did this using image transfer methods and digital printing directly onto fabric. I also had some mini thermofax screens made, so that I could print the text easily throughout the piece. It is wall mounted. Each individual piece is hung separately so there is space between each component. The individual pieces are for sale. The pieces that were sold in Stroud have been replaced with a ‘ghost’ image of the original piece printed onto tracing paper. I like the way that this represents the fact that some of the world’s coral species are slowly disappearing. These ‘ghost’ images may increase if sales are made at each venue! I hope they will become aware of the catastrophic bleaching events that are taking place on the world’s coral reefs. Thank you Shelley. I think people seeing your work in the gallery will be struck by how you have visually represented global warming and how the warming oceans are effecting coral reefs, such a fragile environment. If you want to see more of Shelley’s work in DIS/rupt then remember the dates. The countdown to Oldham is in full swing, labels and packaging being checked and in just over three weeks DIS/rupt will open to the public in Gallery Oldham. Fine time therefore to find out from some more members about their work. 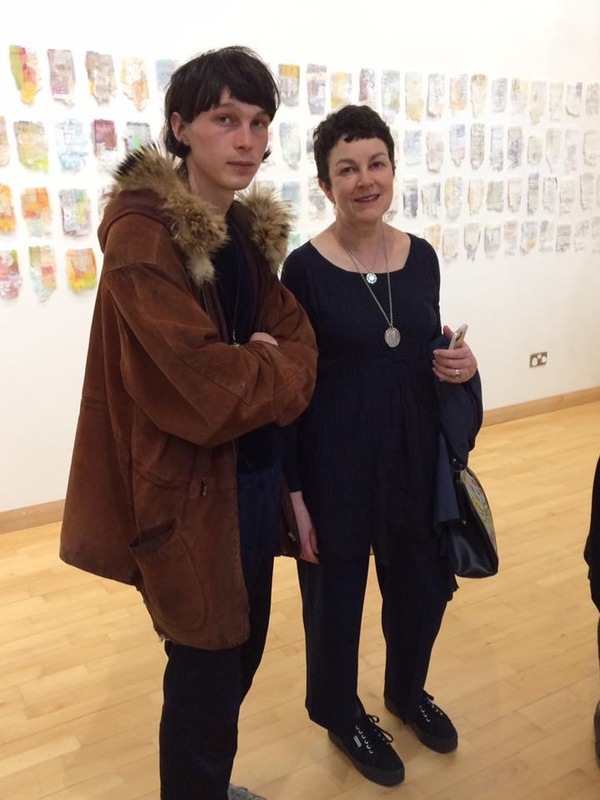 I recently managed to chat with Janet Edmonds, author of several very popular books, about the work she will be submitting in Oldham. First of all I asked Janet about the specific area of the DIS/rupt project she was investigating or exploring? I did some drawings to explore the idea of huge waves hitting the coastline but had great difficulty in trying to workout how this could be made. Over a period of time I began to consider the wider issue of the power of the sea as it makes landfall. Originally, I wanted to create a piece that would appear to burst through a wall which would mean making two pieces, one for either side. Due to life’s complications, I have had to modify my ideas and make something that I could do in the time I have available. Finding the right material to support my ideas took some time but eventually I made a breakthrough to the problem I had in supporting the fabric. I discovered Varaform, a material that can be moulded and shaped using heat or spraying with water. It becomes sticky so enables fabric to be fixed to it and retains its shape when cooled or dried. It also remains possible to hand stitch through it. I intend to make some fabric by machine to add to the piece and I am knitting with clear monofilament, again, to add to the hand stitched waves. That sounds really interesting Janet, are you able to give us an idea of the scale of your piece? The piece is not as large as I would like but is a metre wide and should be almost as high although I have not yet reached that stage. It will extend outwards from the wall. The piece will be dimensional but wall hung and may be lit from within if the work goes according to plan. Recent world news has brought us many horrific images of the damage and destruction that the sea can wreak when it reaches landfall. The energy within the waves heightened by adverse weather conditions is terrifying, even more so at close quarters. I hope that viewers will get a sense of the power of the sea and reflect on how small and insignificant we are against its might. Thank you Janet, it will be of great interest to visitors to see the finished piece. If you would like to see Janet’s piece and all the other work in DIS/rupt when it opens on Saturday 2nd December then remember the dates for Gallery Oldham and the other venues and check earlier blog posts for dates and information about the workshops and artist talks on offer. 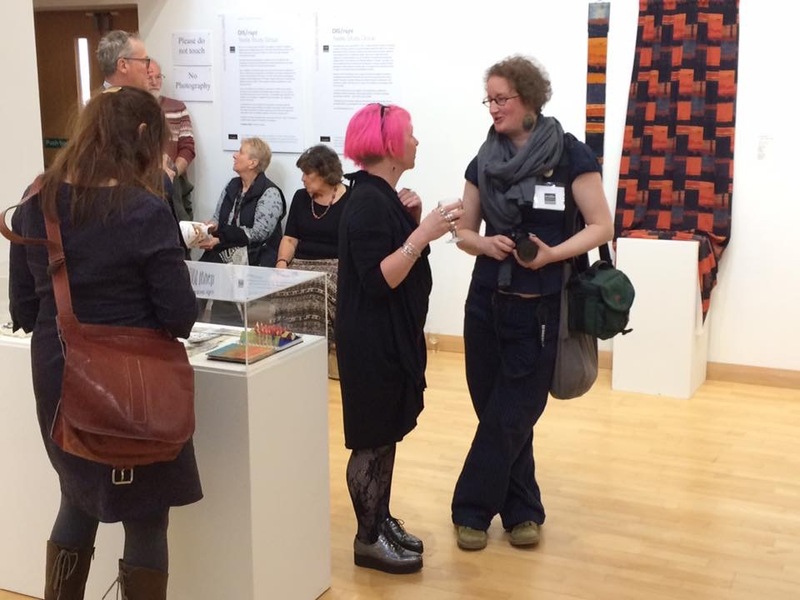 Full information, about Gallery Oldham can be found here Gallery Oldham and the gallery can also be found on Twitter @GalleryOldham. We will resume our series of Studio Postings very soon, so please keep an eye on this blog as the weeks pass in the countdown to the DIS/rupt exhibition opening in Oldham.